Want a winning Pinterest strategy? Bloggers should know that Pinterest made some major changes this year. In this in-depth guide, we’ll share Pinterest SEO best practices for 2019. Affiliate Disclosure: This post may contain affiliate links, which means we may receive a small commission, at no cost to you, if you make a purchase through a link. 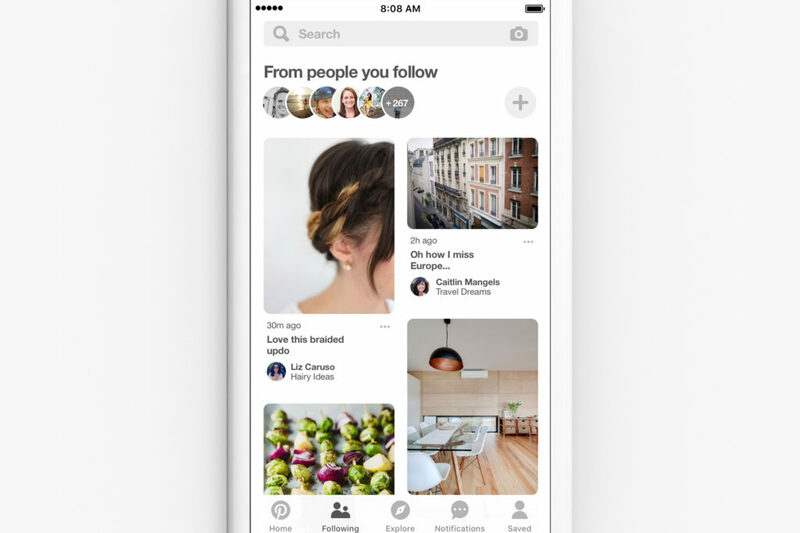 If you’ve ever wished you could just see content from people you follow… well, Pinterest was listening and now you can. In March 2018, Pinterest started rolling out the following tab, which only shows content from people you’re following. Your first five pins of the day (starting at UTC midnight) are prioritized for distribution in the following feed. Hashtags are relatively new to Pinterest, and the way you get your content into a relevant hashtag feed is easy – just use relevant hashtags. But, before you go and add hashtags to all your old pins, don’t bother! The hashtag feed is ordered by freshness, so adding hashtags to old pins won’t have any effect. Simply add hashtags to new pins from here on out. They’re here to stay. 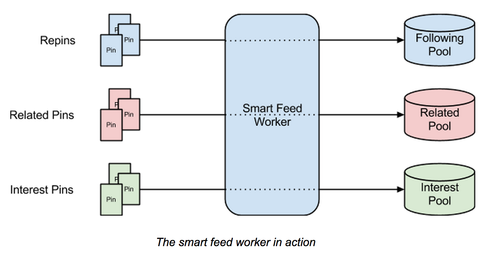 The “Smart Feed” is the algorithm that Pinterest uses to determine what a user sees in their Pinterest home feed. But how does Pinterest decide which pins to choose and how do they choose pins to show in search? Well, like any search engine algorithm, Pinterest’s algorithms are complex and they hold their cards close to their chest. Step 2. Claim your website to show Pinterest that you are a legitimate pinner. Step 4. Be a consistent pinner. Make sure you’re pinning consistently every day. Pinterest would prefer you to pin 10 pins a day, every day, than 70 on one day and none for the rest of the week. This is easy to manage using a scheduling tool like Tailwind, an approved Pinterest partner. Step 5. Create and pin high-quality content that gets many saves and comments. Pin quality is determined by the popularity and engagement level of your pins. If a lot of people closeup, click through, save, add a photo or comment on your pin, Pinterest will view that as a high-quality pin. We distribute your content to your followers first to figure out what’s resonating. From there, we distribute your best performing Pins to other people who are looking for ideas like yours. Pinterest also looks at all versions of your pin when determining pin quality. So if you save one of your pins to another board, Pinterest adds up how many saves and comments that pin received as well. In fact, as of 2018 Pinterest has started to combine comments and photos from every version of your pin. Now, when you pin something, if you wait a few days, you’ll find comments and photos will show up on your pin from other pin versions. The entire point of a blog post headline is to get people to read the next sentence. Similarly, a juicy or compelling headline goes a long way towards getting saves and comments on Pinterest. Use the Pinterest-recommended image size of 600 x 900px. Pinterest stated pins over this size will not be distributed as widely. If your pins aren’t being saved from your personal boards or your group boards, consider leaving (or archiving) them. However, also check for clicks to your site in Pinterest Analytics – you don’t want to leave a board that’s getting you clicks! If you want to give a certain pin a boost, there are many groups on Facebook that run promo days where you can post a link to your pin and ask for saves. However, are share/like exchanges really beneficial? A boost in saves that helps your pin look better to Pinterest. Your pins may be negatively affected by being saved to irrelevant boards. Your pinner quality ranking could be negatively affected by reciprocating and saving poor quality pins that don’t fit your niche. Should you participate? As a general rule, we recommend that you avoid like/share exchanges because most of them cause unnatural saving activity and can get you penalized by Pinterest. Should you participate in follow exchanges? Definitely not! The 2018 update places huge weight on follower engagement, and you aren’t going to get the right kind of followers from a follow exchange. Instead, allow your followers to accumulate organically. They’ll be much more engaged with your content which will improve the overall quality of your Pinterest account. Pinner quality is largely based on how well your content is received. Do you receive a lot of saves and comments? Do you pin content that Pinterest already rates as high quality? Are you an active Pinterest user? How often do you pin? As a bonus, Tailwind is packed with analytics and other features that will help you identify your best performing boards and pins and tweak your strategy for more saves and comments. Step 2. Pin already popular content to your boards. Check out Repinned.net for the most saved Pinterest pins by category. Simply do a search for your topic on Pinterest, and usually the first pins to come up are very popular with thousands of saves (even if you can no longer see the exact number). Tip: If you want to check how many saves a pin has had, you can see this information on the mobile app. Follow the steps in “How to Increase Pin Quality” above. Use Pinterest analytics to find out what your top performing pins are. This is likely to be content that resonates most with your followers. You can see that my audience is interested in Instagram and Pinterest marketing (especially this very post!) 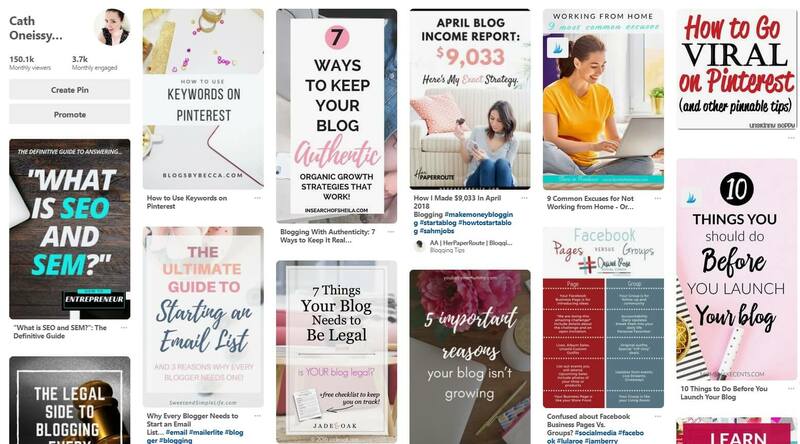 I can use this information to guide my content calendar so I can create more posts my followers want to read and will engage with on Pinterest. Up until this point, we’ve discussed how to increase your authority in Pinterest’s eyes. 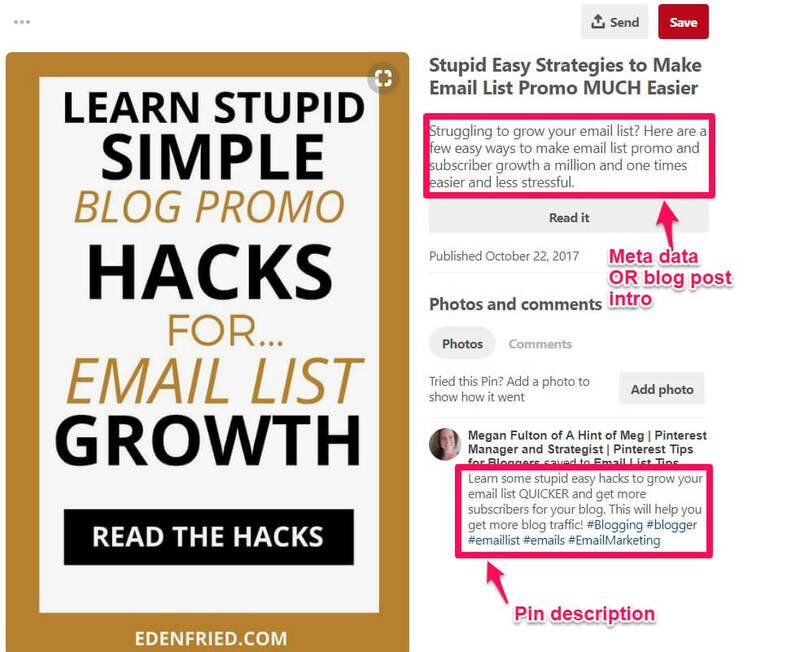 But even if Pinterest views you as a high-quality pinner, they won’t show your pins to their users unless they think your pins are relevant to their users. Relevance is how closely your pins fit your audience’s overall interests, specific searches, and recent search history. If you know much about SEO, you’ll know that the only way for a search engine to know what your content is about is with keywords. Just like on Google, keywords influence what appears in searches on Pinterest. While domain quality, pin quality and pinner quality tell Pinterest how important your pins are, keywords tell Pinterest what your pins are about. So how do you use keywords to show Pinterest that your content is relevant? Step 1. Do Pinterest keyword research. 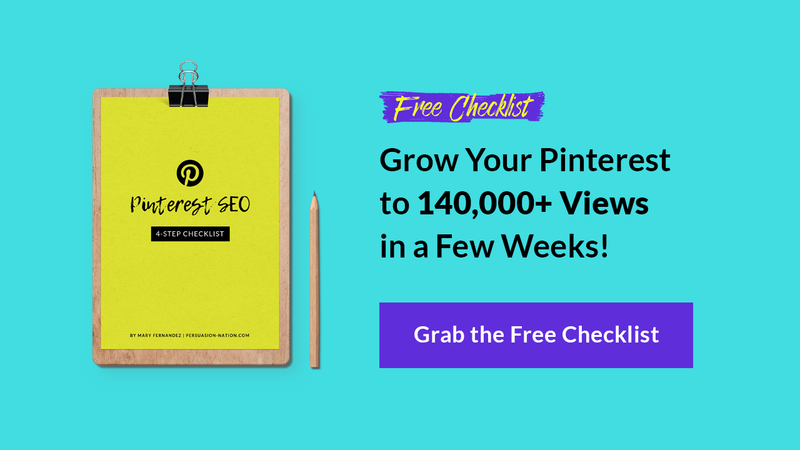 When it comes to optimizing your pins for SEO, you may be wondering whether there is a good Pinterest keywords tool you can use. When you’re typing in a search query on Pinterest, you’ll notice that it auto-suggests keywords to you. Similar to the way Google does. These suggestions are popular search phrases. After you’ve run a search, a set of suggested keywords will appear beneath the search bar for you to add to your search to narrow it down even further. Like Google SEO, Pinterest SEO is all about long tail keywords (think multi-word phrases rather than single words). There’s a lot of competition for general keywords, so the key is to get as targeted as possible with long tails. Sadly, you can’t see the exact number of searches for keywords on Pinterest. But, if you’re interested you can look at Pinterest categories and drill down into Topics to see how many people have indicated that they’re interested in the topic. This will give you an idea of how popular any given keyword is. Step 2. SEO your Pinterest profile. Your username determines the URL of your Pinterest profile. You can use this to add one of your broader keywords or, alternatively, use your business name. To add a business name, you’ll need to upgrade to a business account. You’ll get access to analytics, promoted pins, and you’ll also be able to claim your website. Pinterest gives you plenty of space in the business name field to add keywords. Add keywords right after your business name to show people what you do. For example, Pinterest experts like Peg Fitzpatrick and Anna C. Bennett show up in the top results for “Pinterest Tips” because they’ve included the “Pinterest Tips” keyword in their business name. Next, add keywords to your bio. You’ve got a short 160-character space to fill with your bio. This is not the place to get wordy. You need to be concise, mission-focused, adding keywords and a call to action in there as well. Step 3. SEO your Pinterest boards. If you want your boards and the pins on them to be found in the search, optimize them with intelligent keywords. Both in the title of your boards and in their descriptions. 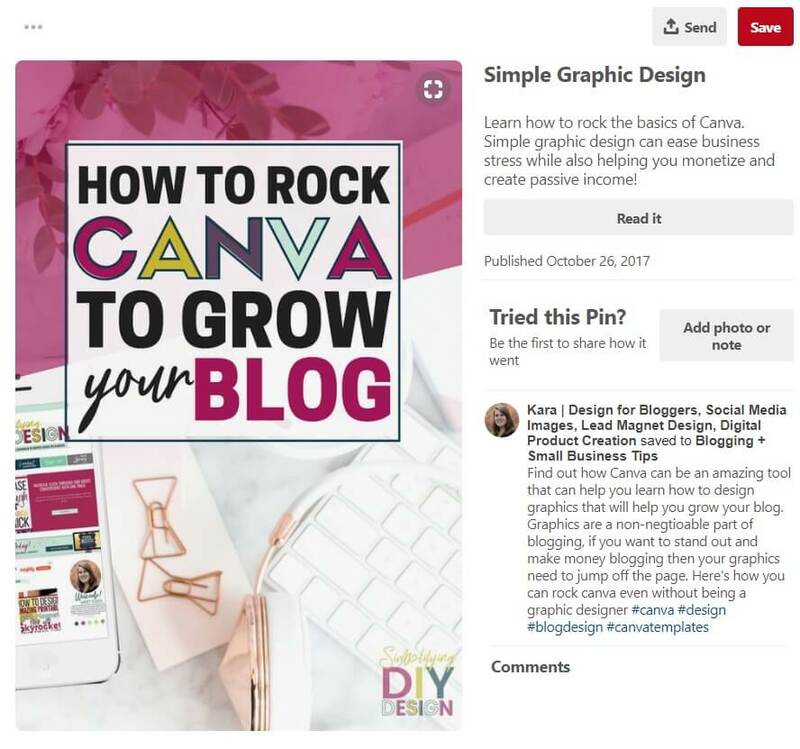 Pinterest recommends always saving your own content to your most relevant board first because the keywords of your board stay with the pin and will help Pinterest categorize it an distribute it when relevant. This is why it’s incredibly important not to use cute board names like “Yummy!” or “My Style Miles” – these boards (and the pins on them) are probably never going to show up in a search. That’s not what you want if you’re using Pinterest for business. As of November 2017, there doesn’t appear to be any penalty for “keyword stuffing” your board descriptions. However, this may change in the future, so strive to make your board descriptions as user-friendly as possible. Also make sure to categorize your boards correctly. If you’re saving marketing content to a board that’s categorized as “Animals”, you’re sending conflicting messages. Finally, you should never save irrelevant content to your boards. Pinterest has said saving content to an irrelevant board won’t help and can hurt your distribution. Step 4. SEO your pin descriptions. Don’t forget to optimize your pins themselves by adding keywords to the descriptions. As of 2018, Pinterest is experimenting with how much of the title and pin description they show in search and the home feed. It’s not enough to just write an enticing description anymore, sadly, most pinners won’t even see it unless they Inclick on your pin. So which do you choose? Keywords or an enticing description? You need to be doing both! Keywords are what will get your pins found in search and enticing descriptions are what will get you the click. Step 5. SEO your text overlays and make relevant image choices. In 2017, Pinterest introduced Lens, a visual search function that allows you to take a photo of a product and Pinterest returns pins it thinks are a match. If you sell a physical product, make sure it’s front and center in your image! Pinterest may be able to read your text overlay. Pinterest can see your images and is making associations with similar ones. Make sure you’re using your keywords on your text overlays and making relevant image choices. Step 6. SEO your blog posts. 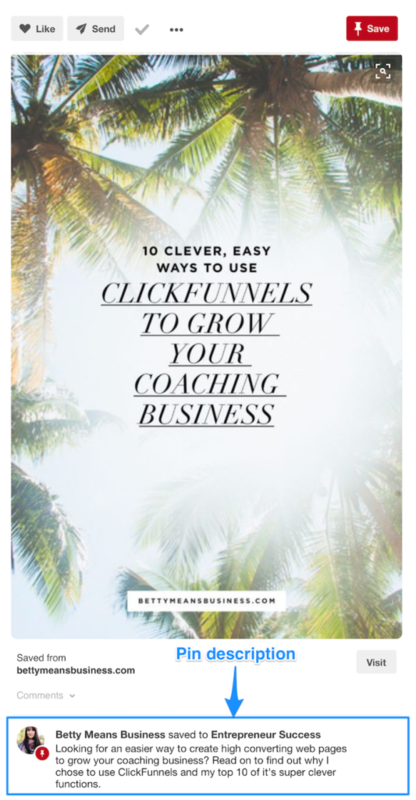 Another thing you can do with your keywords is to use them in your blog post title and in the body of your post. Using keywords here will transfer through to Pinterest if you’ve enabled rich pins. It’s also very important to optimize your meta description (or first few sentences of your blog post) to entice Pinterest users back to your blog. 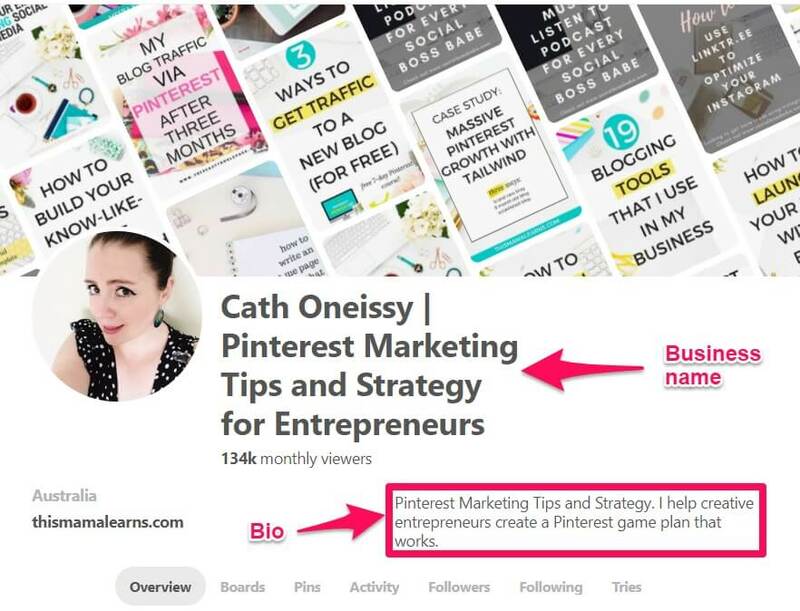 You can see from this example that the info Pinterest brings across with rich pins is far more prominent than your pin description. So, you want to optimize it to be both compelling for a reader, and keyworded for Pinterest. Step 7. SEO your buyable pins. If you are using “buy it” buttons on your pins, don’t forget to SEO those pins as well by using keywords in your pin title and description. Step 8. SEO your hashtags. Hashtags are new to Pinterest, but that’s no reason not to use them! Make sure you’re choosing hashtags that are relevant and specific to your content. When you save a pin, if you type the ‘#’ sign and start entering in a potential hashtag, Pinterest will populate a drop down list that shows how many pins are within each hashtag. Step 9. SEO your board sections. Board sections were rolled out on Pinterest beginning in September 2017, and looks like they’re here to stay! Basically, board sections are like shelves within boards. Board sections are a way to give Pinterest more data about your boards and pins, so make sure you use keywords. You aren’t penalised for not using sections, but if you have a broad topic board it’s a great way to improve your SEO. For a very niched board, you don’t need to use it. Tip: Consider using sections for a ‘Dinner Recipes’ board, but not a ‘Chicken Recipes’ board. Now you know how to get your pins to show up on Pinterest. However, there are still a few questions that are commonly asked about Pinterest, especially when it comes to SEO. 1. Should you delete underperforming pins? No, Pinterest has confirmed in a recent interview that you should not delete pins. A dud pin isn’t going to bring down the results of your account and may even see a resurgence later. 2. Should you change the description when you repin other people’s content? There are a lot of bloggers and website owners out there who don’t know much about Pinterest. As a result, there are a lot of great articles being let down by descriptions lacking in keywords. It takes time to change the descriptions on pins. And it seems like it would benefit the blogger who owns the pin more. However, it benefits your pin quality to get more saves, even if they aren’t your own original pins. If you try this, monitor your results and weigh it against the time investment. 3. Should you use hashtags? Yes! Hashtags are a surprising new addition to Pinterest given their previous anti-hashtag stance. Pinterest now recommends using no more than 20 hashtags per pin. Hashtags are clickable and searchable, but unlike the rest of Pinterest, pins are shown in order of ‘freshest first’ rather than ‘best first’. This means you should only add hashtags to fresh pins, so don’t worry about updating your older pins with hashtags. 4. How do you make sure your optimized descriptions are used when people pin your blog posts? If you run your blog on WordPress, you can use a WordPress plugin like Social Warfare to add the description and image that you want people to use when they pin your blog post from your website. Alternatively, if you aren’t using a plugin, add your description to the “alt text” of your image. The alt text is where Pinterest automatically pulls your description from. 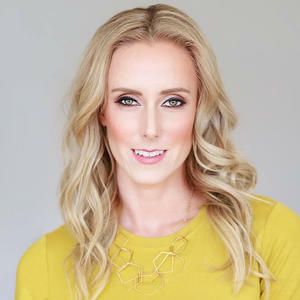 What’s next for Pinterest SEO in 2019? Like most online platforms, Pinterest is constantly tweaking and improving their service. In 2017, some of the most noticeable changes were the introduction of hashtags, board sections, visual search, and the removal of likes and repin counts. So far in 2018 we’ve seen a massive update to best practices, the introduction of the new following feed and the first five pins priority distribution, a new profile look, and (rolling out now) new look pin stats that are in near-real-time. 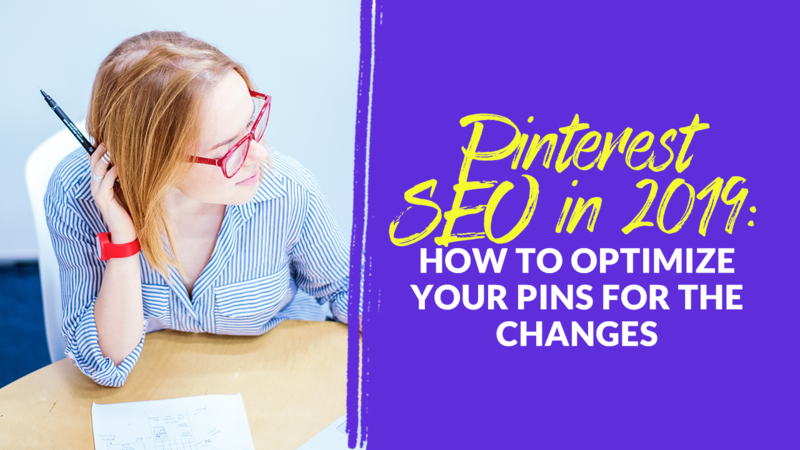 With all these changes, it’s impossible to predict with certainty the direction Pinterest SEO is going to take for 2019. If they loosely follow the evolution of the Google algorithm, it’s possible that we’ll see a crackdown on duplicate content (likely already in the works with pin canonicalization and near-real-time stats that will combine data from all instances of a pin on Pinterest), keyword stuffing, and penalties for pinning irrelevant content (there’s certainly no benefit to doing this anymore, if there ever was). All of these tactics are a way of “gaming” the algorithm, which certainly puts them in a precarious position. The answer is simple. Do what every search engine wants you to do: focus on creating high-quality content for your readers. 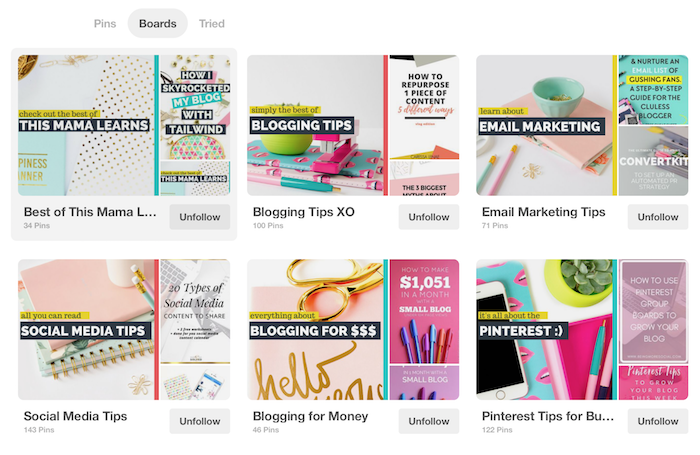 In this guide, we showed you how to use Pinterest SEO to boost your blog traffic this 2019. We also introduced you to the Smart Feed algorithm, some of the new features and changes on Pinterest, and how to optimize your pins so they show up in search and in the feed. Now it’s your turn. Go ahead and flesh out your Pinterest bio, boards, and pins with relevant keywords so that your content gets found. Try out the different tactics we shared above, and make sure to monitor your results. If something’s working, you’ll want to know what it is so that you can do more of it! How’s your Pinterest strategy going? Are you optimizing for Pinterest search? Let us know in the comments! Cath Oneissy is the blogger behind This Mama Learns where she shares her love of Pinterest with the world. When not hanging out on Pinterest, you can find her whipping up tasty treats to appease her picky toddler.